If you are a visitor to the uniquely charming state of Louisiana, plan a ghost-hunting adventure and stay at one of Louisiana's many haunted hotels. And if you are a resident of Louisiana, get to know your state's spookier side and embark on an exploration of the unexplainable and visit one of Louisiana's very own haunted hotels. One of its most haunted "hotel" is the historic Myrtles Plantation that is considered to be one of the most haunted places in America. New Orleans is a wonderful, magical place. It conjures up feelings that must come from an other-worldly influence. 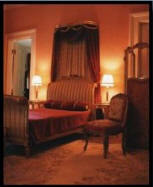 The Hotel Monteleone in the French Quarter is proud to reveal its haunted secrets. A restaurant door that opens almost every evening and then closes again, even though it is locked. An elevator that stops on the wrong floor, leading a curious couple down a hallway that grows chilly and reveals the ghostly images of children playing. 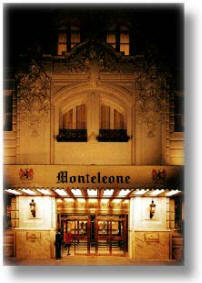 In March 2003, the International Society of Paranormal Research spent several days investigating Hotel Monteleone. While at the hotel, the team made contact with more than a dozen earthbound entities. Among them were several former employees, a man named William Wildemere who died inside the hotel of natural causes, and a boy who was much older when he died but enjoys returning to Hotel Monteleone as a 10-year-old to play hide-and-seek with another young spirit. 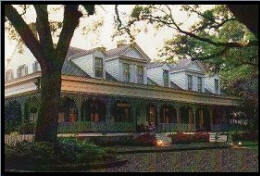 The Myrtles Plantation is known to be "one of America’s most haunted homes." Located in St. Francisville, Myrtles Plantation is about an hours drive northwest of Baton Rouge, which is then another two hours from New Orleans. This widely documented antebellum mansion, built in 1796, has seen its share of murders and lurid stories. Is this why it’s so haunted? Or is it the rumors of it being built over an ancient Indian burial ground? 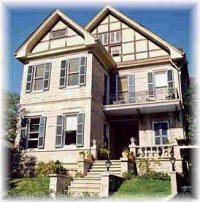 Stay overnight in one of its eleven rooms and maybe you can meet one of its many ghosts yourself. One of its most well known ghost story involves Chloe, a slave of plantation owner, Judge Clark Woodruffe, who became one of his many mistresses. He was married with three children, but this did not stop his indulgences. He eventually grew bored of Chloe and acquired a new dalliance. A spurned Chloe soon began eavesdropping on Woodruffe family. However, she was caught, and to teach her a lesson, her ear was cut off and was sent to work in the fields. Chloe began to wear a head turban to hide her disfigurement. Chloe’s real trouble only just started. To celebrate one of the Woodruffe’s daughter’s birthdays, Chloe baked a cake. However, she added a few oleander leaves to the recipe – a very poisonous plant. It is widely debated whether she poisoned the cake intentionally to exact revenge or as a scheme to make the children a little ill so that she would be asked to come back into the house and take care of them. Two children and the mother ate a piece and fell ill. Chloe was asked to come back and take care of them. Unfortunately, all three died from the poison. The other slaves, fearful the plantation owner would assume guilt by association, took Chloe from the house and hung her. The ghosts of Chloe, the two children and the mother have been reportedly seen on the property. 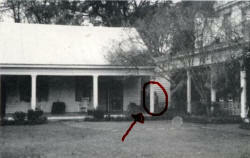 There is a photograph which shows a shadowy figure with a turban standing by the house (above). She has also been seen inside as well. The children have been seen on the verandah, hallways, and the children’s dining room, where they ate the poisoned cake. There has been other ghostly activity besides Chloe and the Woodruffe’s. Other ghostly activity noted at the plantation include a ghost at the grand piano who practices the same chord repeatedly – until someone enters the room, a ghost of a French woman who wanders from room to room seeming to search for someone or something; a portrait that somehow changes expressions, and a young girl who only appears just before thunderstorms. 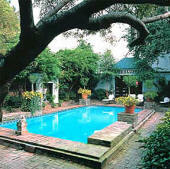 Other ghostly accounts at Myrtles include a human-sized spot on the floor that refused to be mopped. While mopping, there was some kind of force preventing the mop onto that spot no matter how hard the mop was pushed. There is even more ghost stories reported – almost too many to recount. Guess you need to visit the plantation and discover your own ghost story. When you come to New Orleans, you generally expect to hear non-stop jazz. However, if you happen to be staying at the Hotel Mason de Ville and staying in their Audubon cottage #4, don’t expect jazz – expect country. Why in heavens could country be heard in New Orleans by golly? Well, there is an honest to god, Shania Twain-Faith Hill-country music-loving soldier who prefers only country in cottage #4. And did we mention he is also a ghost? This ghost first showed itself about twenty years ago. Apparently, a hotel employee opened the door to Cottage No. 4 for a guest and both saw a man dressed in military uniform, who then suddenly disappeared. The employee also reports that every time she changes the cottage's radio to a classical music station, the ghost changes it back to a country music station as well as he cranks up the volume as soon as she leaves. 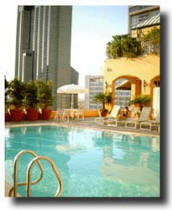 Cottage #4 is not located on the same premises as the main hotel. Cottage #4 and the rest of the cottages are just around the corner from the main building on Dauphine Street. 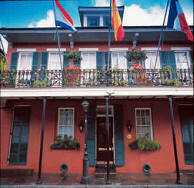 The 1891 Castle Inn of New Orleans is located in the beautiful and lush Garden District of New Orleans. It is within easy walking distant to St. Charles Ave, thus the opportunity to take the city’s streetcar is right as your footsteps. The only glitch to the 1891 Castle Inn: as of now, they only offer their nine rooms for those who plan for extended stays in the city. 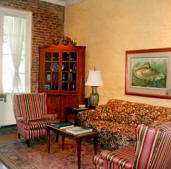 However, if the policy changes or you do plan on staying in New Orleans for a longer time, staying at the 1891 Castle Inn can almost guarantee you a meeting with one of their resident ghosts. 1891 Castle Inn’s first legendary ghost was a paid servant. He was a light skinned black man who spoke several languages, loved the ladies and music, a drinker and a smoker, and quite the prankster. He died in a fire set either by smoking in bed or by knocking over a heating pot. He was too drunk too wake and perished in the fire. Apparently his ghost is responsible for the coughing and whistling heard in the hallways and is affectionately referred to as the "translucent man" because he is often seen in mirrors or briefly seen out of the corner of guest's eyes. He plays with the radios, televisions, ceiling fans, and lights. Like the prankster in real life, his ghost still enjoys playing pranks on the inn’s guests by moving objects to different locations or hiding them! An example of one of his pranks is when one of the guests could not find receipts he collected during his trip after he put them in his wallet. His wife eventually found them all in the microwave after they searched the room from top to bottom. The second known ghost is a little girl who drowned in the pond behind the house. At the time, she was wearing a white dress and was barefoot. Her ghost wanders the neighborhood in search of her mother and is a frequent visitor of the inn. She is the one responsible for water turning on and off, women being touched on the leg (as if brushed by a cat), beds seeming to have someone bouncing up and down on it, and the sound of bare feet running down the hallway. "The first night I saw a large shadow moving around the room for quite a long time. The bed was pushed once and my girlfriend and I heard footsteps continuously, up and down the stairs outside of the room until about six o'clock in the morning. On our second night, we think the spirits in the house were used to us. The window was rattled twice without the help of wind or traffic, and we too saw a flash of light in the room. It was like a camera flash, very strange. We had a great time. Thank you for the stay." "We opted to sleep with the lights that night (like that would really help us). I heard the sounds of someone moving furniture all over the house, like my friend the two nights before. I also had a sense someone was watching us in the room, but hadn't seen ghastly_tales_for_adults.htm. At 1:30 AM, my friend and I starkly woke at the exact same moment, and felt an immense presence in the room. It was much larger than the presence of a human. During this feeling, I had the sensation of a soft caress on my foot and up my leg, followed by fingers caressing my scalp and hair. I couldn't think about sleeping the rest of the night, but continued to have the sensation someone was watching me until about 4:30 AM. At that point, all noises died out."